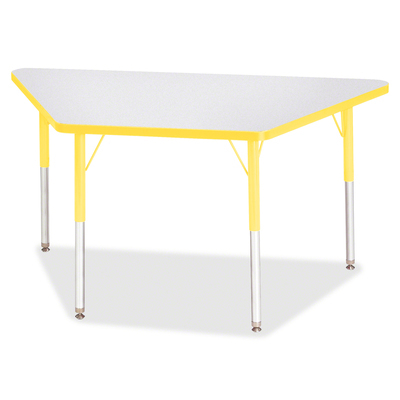 Trapezoid-Shaped Activity Table For Adults Is Perfectly Sized To Let You Work Comfortably. Multiple Trapezoid Tables Can Be Conveniently Arranged In An Assortment Of Configurations To Accommodate Any Space. Durable Laminate Features An Easy-To-Clean Surface. Truedge Is Permanently Thermo-Fused To The Edges To Prevent Chipping. Extra-Safe, Dual-Screw Steel Legs Allow You To Easily Adjust The Height Of The Table. Powder-Coated, Adjustable Legs Can Be Repositioned In 1" Increments To Provide Maximum Comfort. Leg Guides Reduce Squeaks, Prevent Snags And Eliminate Rusting..
Trapezoid-Shaped Activity Table For Adults Is Perfectly Sized To Let You Work Comfortably. Multiple Trapezoid Tables Can Be Conveniently Arranged In An Assortment Of Configurations To Accommodate Any Space. Durable Laminate Features An Easy-To-Clean Surface. Truedge Is Permanently Thermo-Fused To The Edges To Prevent Chipping. Extra-Safe, Dual-Screw Steel Legs Allow You To Easily Adjust The Height Of The Table. Powder-Coated, Adjustable Legs Can Be Repositioned In 1" Increments To Provide Maximum Comfort. Leg Guides Reduce Squeaks, Prevent Snags And Eliminate Rusting.